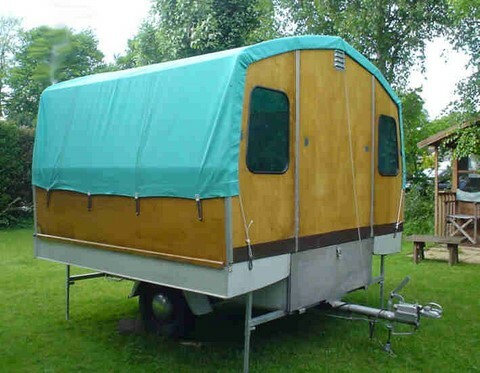 Around 1970 we purchased a second hand Norwegian-made Trailer Tent called the Lillebror (Little Brother) Chateau Mobile and have since used it on many holidays. It is much more comfortable than camping in a tent and, being quite substantial and off the ground, can be used in most weathers. It also trails very well and, unlike a caravan, does not obscure the view in rear view mirrors. We have taken it to France without problems. 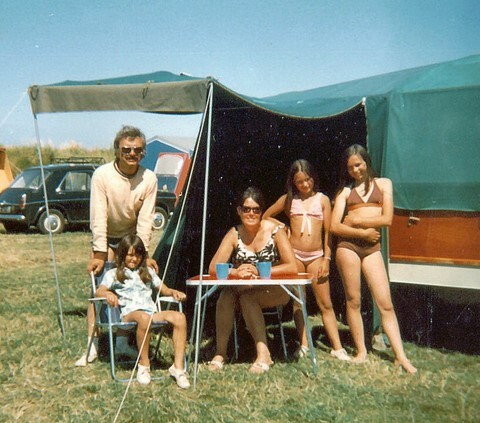 After 40 years or so the canvasses of the awning and the main tent inevitably became weak. In 2006 we finally dispensed with the awning and replaced the main canvas. 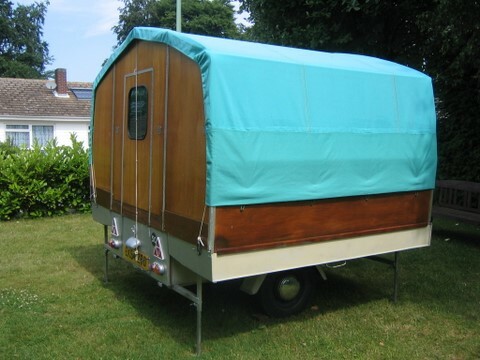 We had the new 'tarp' made by a comany in Cambridge, who did an excellent job at a reasonable price (�0 at the time) The whole thing looks rather like a traditional gypsy caravan and is now regarded as a 'classic'. EVERY time we take it on holiday we have people coming over to have a look and ask us about it. 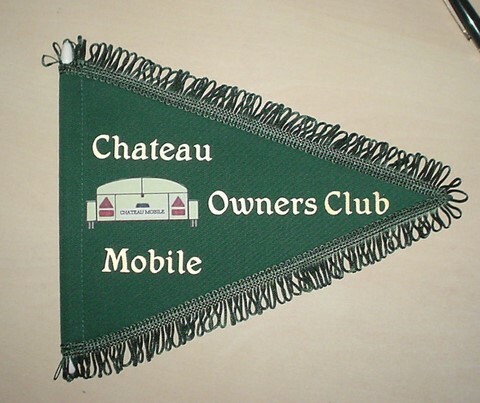 I designed a pennant for owners of the Chateau Mobile trailer tent and sold 19 . The shop that produced them was willing to make a fresh batch of ten but I decided not to proceed with the penant making business ! You are welcome to my design. There is a thriving Owners Club on Yahoo at http://groups.yahoo.com/group/chateaumobileowners And one in Germany at http://www.scholz-bruederchen.de/index2.html. Occasionally you see them for sale there or on Ebay for around �0. One of our better purchases ! 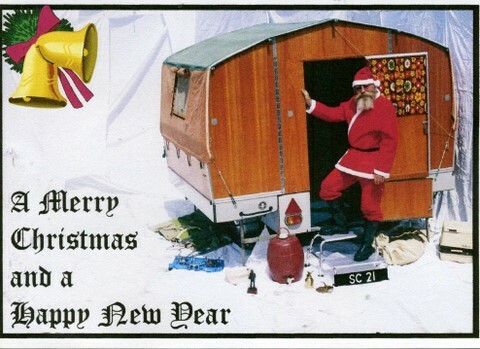 We have finally sold it after 45 years of camping. The CM (as it is affectionately know by owners) was built in Oslo, Norway by the Wideroe Aircraft Company. From this I conclude that ours is a 1967 model, so 43 years old ! Patents on the prototype were taken out in 1955 by Knut Rambol, Oslo. Production began in 1957 and finished in 1971, although the remaining stock was sold until 1974. The factory was the Wideroe Aircraft Company, Alloy Department at Fornebu, Oslo. Some production and assembly also took place at Bjorkelangen. Altogether around 6000 were built. The Chateau Mobile is about 260kg. 153cm wide, 280cm long. Height (open) 185cm. It came with an awning making and area of around 16m2. The chassis has torsion bar suspension. Earlier models had 8" wheels. Later one had 10". Because production was not automated there are many different variations. Some had 3 windows at one end, others had two. All of them had the position for a bunk each side, with poles slotted into sockets in the walls at either end. Until the last production all had varnished plywood walls. 1971 models used Respatex plastic. 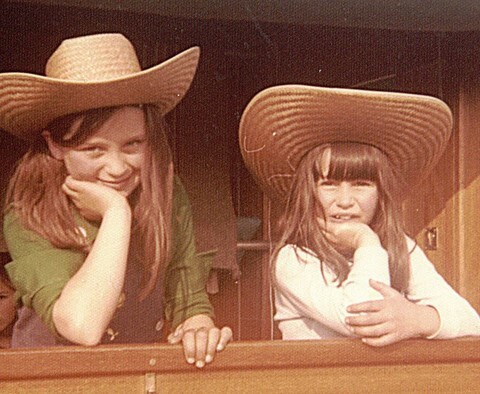 Original costs were �0 in 1967 but that was without any of the extras: awning and bunks. They are still popular and a good example will reach over �0 on Ebay.